It sounds like something created in Dr. Frankenstein's laboratory, but by now, we've all heard about the benefits of live yogurt cultures to our digestive systems. This intrigued me because, I am the groupie of self-improvement, and thought, Why not benefit my digestive system? It sounds like a really good idea! And so I began to experiment with a lot of products in the market. I tend to go for the organic selections first, but I was suckered into trying one of the mainstream products which holds itself out as THE go-to active cultures concoction of all time and promised to set my system right in just a few short weeks. It wasn't organic and after three days, I dropped it. I hated the texture and the taste of the thing. Perhaps it would have done wonders for my digestive system, but it wasn't doing diddly-squat for my palette, so it had to go. From there, I went on to a number of organic yogurts, but I was put off by the watery consistency of many. Okay, you can mix them or drain them, but even after doing so, they're still way too wet and again, the texture isn't right. In truth, they lack the correct viscosity. The flavors of these alternatives were definitely better and, in a pinch, I would buy them again. 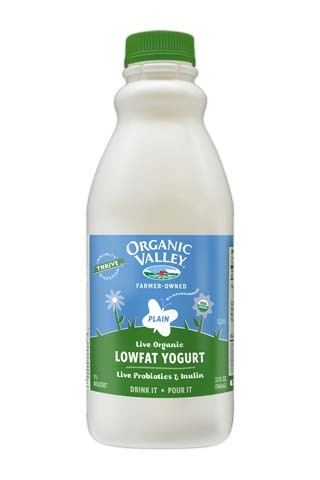 But really, I wasn't smitten until I found Organic Valley's Live Organic Lowfat Yogurt. It comes in a bottle and you pour it out like any other drink. It is a creamy, dream-like yogurt. It comes in three flavors: plain, berry, and vanilla. I love the plain version, and I drink it every day. Shake the bottle really, really well, add some fruit, honey, or jam, and it's perfection! My preference is to add a couple of spoonfuls of homemade jam. Since I make the jams, I can control the sugar in the mix. I add, cherry jam, strawberry jam, or Mungo's Mango Jam. 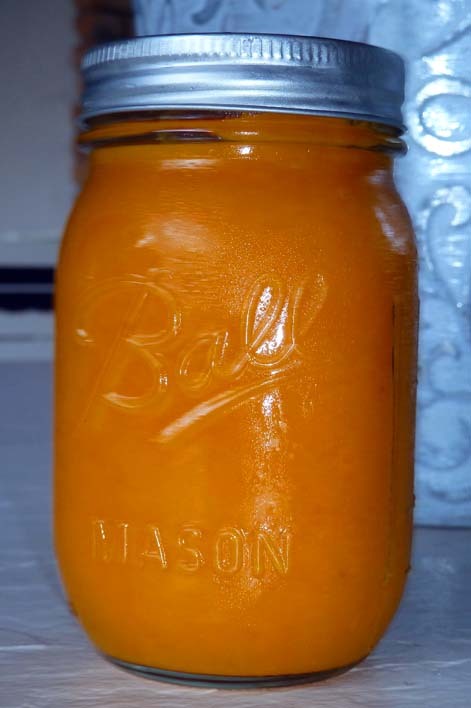 Here's a link to the recipe for Mungo's Mango Jam for all you who missed it: http://lovetoeat.blog.com/?p=20 . Mango lovers out there will find the combination is simply delicious! To find this product, you can go to the Organic Valley website at: http://www.organicvalley.coop/. When I shop for Organic Valley's Live Organic Lowfat Yogurt, I go to my local Whole Foods store. In fact there are two stores that are pretty close by. And often times, I have to scour both stores to find the plain version of the yogurt. According to stocking sources at one of the stores, the plain is the most popular. However, it's the one they seem to carry least of! I'm sure Organic Valley's other flavors are equally good, but since I like to add my own fruit and enjoy using it as a base for other recipes, I go for the plain. Someone needs to tell the Whole Foods people there is a hole in there inventory and they need to fill it. Mix the two ingredients in a bowl and refrigerate overnight to let the flavors get to know each other and marry. If you can't wait this long, then try to let it stand for at least two hours. All great relationships need a little time to develop. Pour this over your favorite green salad and eat up. Low fat and delicious! Something that's for the books is that 8 ounces of this ranch dressing have 110 calories and 2.5 grams of fat. A truly tasty, guiltless dressing at last!